Many companies take the Swiss Army Knife approach to tracking and paying Bills, opting for more than one software platform for specific tasks. For instance, there are Xero users who prefer to pay their Bills via Bill.com due to its user-friendly interface and handy smartphone app. However, the approval workflow available with Bill.com is quite basic. It does not allow for advanced routing based upon predetermined criteria or the authorization level of approvers. So, for larger, more complex organizations, how do we add a multi-step approval workflow to Bill.com? Simple. We turn to ApprovalMax. ApprovalMax is an approval workflow platform designed to cover specific financial approvals such as Accounts Payable. It allows financial managers to select who should approve bills, and under which criteria they should be approved. It also automatically notifies approvers about new bills that are ready for approval, which can then be approved via the desktop or smartphone app, or directly within the email. If you’re looking to exert more control over approvals, and enjoy more detail and insight into your company’s financial workflow, you can achieve this by bringing ApprovalMax and Bill.com together with Xero. To begin, the Bill is sent into Xero with a draft status. It is then submitted for approval within Xero. ApprovalMax steps in and pulls this Bill into its own platform, starting the multi-step approval workflow. After the Bill is approved within ApprovalMax, its status in Xero is changed to “Awaiting Payment”. Finally, at this point, Bill.com pulls the Bill from Xero and handles the payment. It really is as simple as that. By allowing ApprovalMax to handle the approval process, you’ll have peace of mind that payments are being made accurately and responsibly. How Do You Setup This Workflow? It couldn’t be easier to set this up. There is one setting within Bill.com that needs to be updated so as to ensure that the only Bills being pulled from Xero are the ones with the status of “Awaiting Payment”. 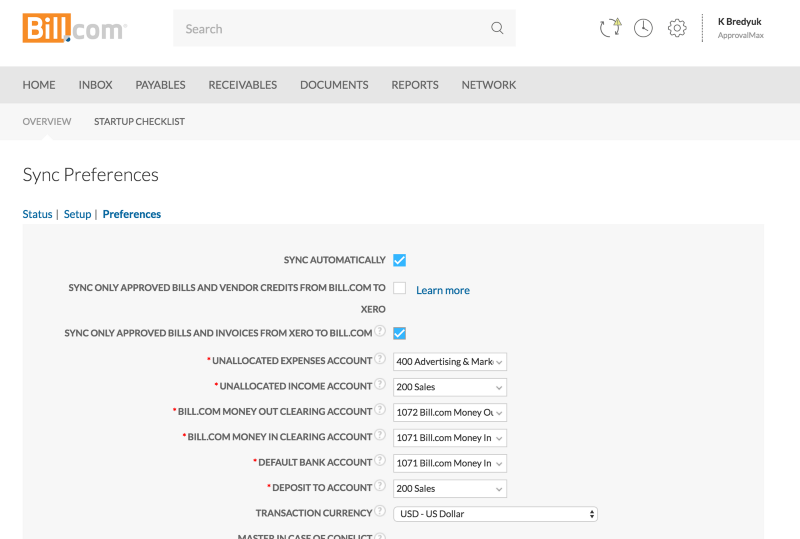 Navigate your way to ‘Sync Preferences’ within the Bill.com settings, and check the box that says “Sync Only Approved Bills and Invoices from Xero to Bill.com”. There are a number of benefits to adding this additional measure to your approval workflow. In particular, you can save countless hours trying to manually organize an approval workflow via email. This approach is both unwieldy and prone to errors. What’s more, you can enforce policies and authorize payments according to different authorization levels as defined by your company’s approval matrix. And you can continue to use Bill.com as your payment solution, even if your business has outgrown its approval functionality. More control. More accuracy. Fewer mistakes. By introducing ApprovalMax into your financial workflow, you’ll have confidence that your business is making the right payments, on time, and never paying more than it needs to. And if you’d like to give it a go, sign up for your no-risk 30 day free trial here.